Interviews with DIY Specialists for outdoor spaces for your home. It’s the time of the year where we begin to take stock of our homes, the projects we completed and those that are moving to next year’s wish list. The internet has proven itself a great place to find inspiration for projects and home styling, especially as Do-It-Yourself has become a bigger part of our culture. It’s a way for you to have a true hand in making changes to your home as well as giving your home the personalized look and style it deserves. There are a ton of great sources for projects that start with home improvement stores, Home Depot and Lowes have great sections on their websites that point to projects you can do with the materials they sell. That being said, there are ideas abound on Pinterest and Instagram, so many different ideas and projects that starting down this road can seem daunting. A good way to toe into this pool is to start following the blog or social media account of people who are actively trying to improve their homes and share it with others. DIY specialists, with accounts of what worked and what didn’t, who are trying to fully align their home to a particular style. It’s a great process to see–even if the style is not quite your own, it gives a frame of reference for the variability in scale and detail DIY projects can take while providing an example of how to make sure that you’re looking at the entirety of your home for a seamless or purposefully diverse style. 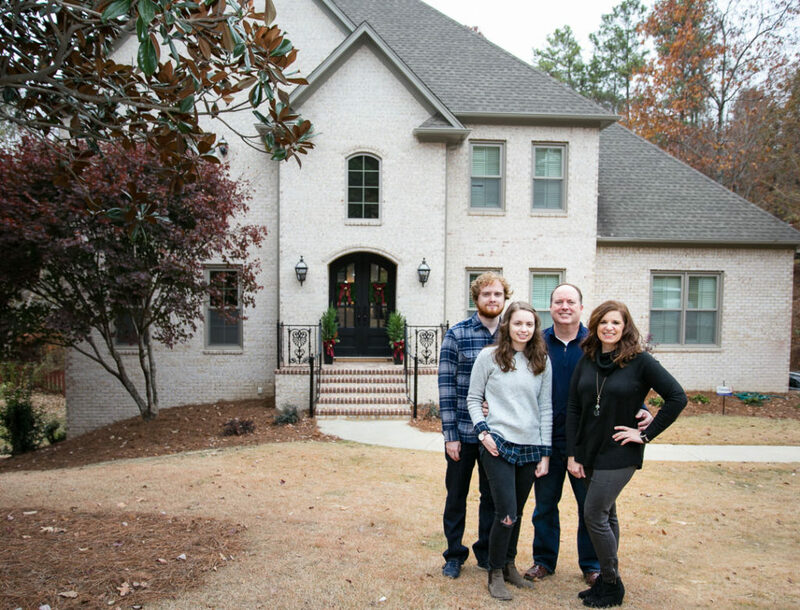 We’ve had the pleasure this season of working with two DIY specialists, Natalie Kolter of My Vintage Porch, and Leslie Davis of Deeply Southern Home. Both women excel at creating curated journeys through their DIY and home styling projects that bring their personalities, aesthetic preferences, and families (including their photogenic pups) into account-along with working on a budget. I reached out to them to get answers to questions about their projects, with the intent of giving a taste of the DIY life to you. Image © Deeply Southern Home. Click to see original. Passionate about design and her southern heritage, Leslie works to create a style that stems from tradition but does not tie itself to a specific time period. Leslie lives in Birmingham, Alabama with her family. Leslie’s expertise spans from room makeovers requiring construction to flipping furniture and crafts. For you patio lovers, she has a fun section of her blog dedicated to outdoor projects. 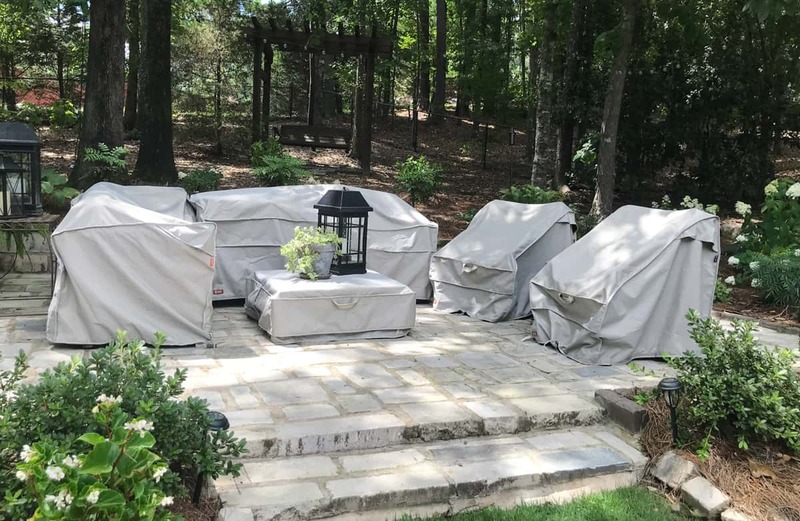 This July Leslie took a look at our Montlake FadeSafe covers, as a measure against pollen, leaves and other minor outdoor debris. We were so excited to see Montlake in action and loved her time-lapse of the covering process, since that is one of the most daunting aspects of covering your furniture. Do you have a favorite area of your home? Is your favorite area to renovate different from your favorite area to decorate or lounge in? My favorite room in our house has to be the kitchen! After our budget friendly renovation, it is the perfect place to cook and gather. I love styling the open shelves in the kitchen area so I would have to say it is my favorite place to decorate as well. As for lounging, our favorite chill space is our basement media room. It’s light and bright during the day but cozy at night, perfect for movies or Netflix! Favorite project to date would probably be our master bathroom. Through many hours of hard work and planning it is an oasis, a perfect retreat for an evening bath or a calming place to start the day. Do you have a go-to tool or resource when working on projects, if so can you share it with us? I don’t have one go-to tool in the tool box. I use them all depending on the project. Having a solid base of tools like a drill, miter saw and a nail gun opens the possibilities for so many projects. As far as resources, I don’t like to use just one source for DIY project help. I want to find an expert in the field and learn from them. I often check several sources before I head into a project I have no prior experience with. Obviously, that includes searches on Pinterest, Google and YouTube. Design or functionality: how do you find balance if there needs to be a balance for you, or do you eschew one in favor of the other? I am a firm believer that function must come first but I never want a completed project to look like I chose function over design. The esthetic component must look like it was the most important part of a room. I also place a great deal of value on the comfort and inviting nature of a space. Those are really important characteristics of design to me. Do you have something that, having done it yourself once, you would never do again (aka least rewarding project)? Also what was the most rewarding project—if that one isn’t your favorite? What well-timed question! I recently tried to reupholster a settee for our daughter’s first apartment. Even though I’ve handled small upholstery projects before, this was bigger project than what I had time for given her impending move-in date. I eventually set it aside and will likely hire it out. We all are fond of this antique and it is worth having it done right. The most rewarding projects are complete room makeovers, like my husband’s library/office space. We built an entire library wall complete with a fireplace where nothing but a blank wall previously existed. That’s completely satisfying. What is you main source of inspiration? I gain inspiration from everywhere! I am always inspired by the colors found in a variety of different landscapes. Creating a color palettes for a room around nature is always a good choice. Of course, I love taking cues from beautiful spaces I see on Instagram, Pinterest and magazines. Do you have a dream project you haven’t gotten to work on? It’s always been a dream of mine to flip houses or renovate rental properties. I feel confident I could balance budget and my design goals to create beautiful places for people to thrive. Also, to see a home completely transformed and then passed onto a new homeowner has got to be the best reward! Do have a favorite picture of Tucker? Our golden-doodle Tucker, he is such a great model!! Probably a photo of him on the screen porch will always be a favorite. He really finds great joy in relaxing on the huge sofa out there. He’s a smart dog! What is your best piece of advice for DIY beginners or enthusiasts? My best advice is to not be afraid to try something you’ve never done before! I always say, you never know what you are capable of until you try! That being said, my best advice would be to do your research, start with small projects where you can develop skills that can take you onto bigger and better projects. How have your DIY projects been most affected by your location? Living in the south, there are definitely outdoor projects that we put on hold during the summer months. It’s just smarter, more enjoyable to do those kinds of projects when it’s cooler. Do you have any suggestions for small touchups or décor projects for fall/winter? The easiest, most effective way to transform a space is paint! The right paint color is the most important design element in a room. I would also add that an updated backsplash can have a dramatic impact on the style of a kitchen. It can be a great, low-cost beginner project. How do you think Classic is fitting in with your home? Montlake Covers on Leslie’s porch. Image © Leslie Davis, Deeply Southern Home. Click to see original. I love that I was able to select from a wide variety of Classic Accessories covers that matched my outdoor space. I was able to choose a fabric that blended well with our stone patio. Image © My Vintage Porch. Click to see original. Natalie Kolter is a mother of three living in Tucson, Arizona. Her blog is a celebration of the successes and joy of renovation and decoration. Natalie’s style is a unique combination of modern and rustic influences that centralizes on a highly curated color palette focusing on white with splashes of natural brown, green and navy accents. Her blog looks at her home renovation projects and has sections for DIY fun-furniture, signs, crafts and more. Natalie also took interest in Montlake, settling on a Grey Striped Hammock with Wood Stand and our Bamboo Umbrellas as accepts to her pool patio space to beautiful effect. I like to make every space in the house feel inviting and cozy. I think that one of my favorite spaces is probably our bedroom since we most recently renovated it and added beams. I have always loved the extra character in a space. I have so many favorites. It’s tough to choose just one but a couple of my favorites would definitely be the beams in our bedroom and the nightstands that we upcycled in there from our old nightstands. I mostly just “fly by the seat of my pants”. lol. When I come up with an idea, I just run with it and do what I need to do to get it accomplished. I like to include both as I desire my home to be “liveable and comfortable” while being visually appealing at the same time. I would have to say [my least rewarding project was] painting my kitchen cabinets! Adding shiplap and wood to our walls has probably been the most rewarding in regards to the character it gives to our home. I’m not sure that I have a project that I would say is the least rewarding. Even project fails help us to learn from our mistakes. Pinterest is something that helps me see what I’m dreaming up in a real life setting. It helps me to see if I will really like the idea that I have before I even start a project. My Dream Project would be to find, purchase, gut and completely restore and/or renovate an old farmhouse or barn. I love old homes with character. Do have a favorite picture of Chester? I would have to say that every picture of Chester. He’s just the superstar of all of the photos. Don’t be afraid to try something new. Start with small projects to build your confidence level in tackling that larger project! And, remember, home improvement and hardware stores will cut wood for you if you don’t have the right saws to make the cuts yourself…and that doesn’t make your DIY less DIY! I love to go thrifting, antiquing and to junk yards…this is where all my DIY projects begin. Tucson doesn’t have the same quality or quantity of the kinds of treasures I love, which means I get to go hunting for them all the more! I refuse to overpay for items I’m interested in, especially when I know what they are (or aren’t) worth. A great budget friendly option for both Fall and Winter would be to use outdoor free items, like wood. I brought home some wood logs one time and cut them to the size I desired and then painted them white. I also distressed them so that they would look like birch logs. You could to the same with sticks and other outdoor items. I have often used pressed leaves in frames for decor as well. I love the hammock and umbrellas from Classic! They are seriously the most durable, beautiful pieces I’ve ever had as part of our pool/patio living space! We’re officially in patio season, why not mix it up this year? Below are some fresh ideas from some of our favorite bloggers. 1. Sarah Le from I am Food Blog has a delightful take on a summer picnic salad. This Vietnamese and foodie inspired the salad uses fresh ingredients like: mint, cilantro and lime, and features quinoa, veggies and a little sriracha for spice. Check it out! 2. Kristin Jackson of the Hunted Interior, created a beautiful backyard oasis as part of a HomeDepot.com style challenge. We noticed her work last year when she stenciled her stained deck with a large graphic pattern making it a unique and bold space: here. Take some inspiration from her latest outdoor creation with a simple palette that pops, a creative wall of plates, and a fun bocce court. 3. Apartment Therapy has a great post to help you get started creating your outdoor dream space. Sounds pretty practical and fun! Once you go through the steps, you’ll have a clearer idea of what needs fixing, what you would like to incorporate, what supplies you have on hand, and what supplies you might need. Browse Apartment Therapy’s site if you’re looking for DIY inspiration, they have a ton of great ideas. Having a smaller outdoor space sometimes means you can’t fit everything in you’d like. You have to be a little creative and think outside the box (or balcony). Here are some creative ways to DIY your patio in style. Ash of Sugar and Cloth, DIYs the heck out of a hand rail – transforming it into a beautiful vertical garden. Genius, pretty and space-saving. She also has a tutorial for some cute stepping stones here. This can be completed in under an hour, I don’t know about you – but time and space are two things I’m short on. This bench is made out of 12 cinder blocks and 4, 4x4x10 pieces of lumber that fit into the cinder block spaces. These materials cost under $40. You can celebrate your own style by painting the cinder blocks and finding or creating cushions you love. Make your storage chest into a comfy bench for your outdoor space. This DIY uses a suspension/curtain rod, pillows and some fabric to transform an ottoman or trunk into a cozy, modern seat. This is a great addition for a smaller yard, patio or balcony. You’ll use a plastic bowl as the a mold, so you can pick the size and depth of your new fire pit. The shopping list is short, and you probably have a few items on hand already – like Pam cooking spray (so the concrete doesn’t stick), and a plastic tub for mixing concrete. Depending on the size you go with, this firepit is easy to move around and enjoy wherever you like in your outdoor space. This is a detailed tutorial for a pretty cool built-in pit. More complicated than some DIYs – but they do a great job with visuals and detailed explanations. All of the steps are accompanied with photos and clear explanations. We think it’s worth it. This fire pit looks modern and sleek – yet the main part is a drum gutted from an old washing machine. If you don’t happen to have an old automatic front-loading machine lying around you’ll need to scout out a junk yard, garage sale or thrift store to score the drum. Let us know in the comments if you’ve made a fire pit before or plan to try one this year.